Eds and Meds . . . and Capitol Domes? I recently participated as a part of an expert panel reviewed Sacramento’s economic development strategy. You can learn more about the city’s “Project Prosper” here. It is rightly focused on identifying what can be do to promote economic growth with inclusion. Like most regions, Sacramento has a strong interest in developing a more diverse, knowledge-driven economy. Although it’s only about 100 miles from tech centers in San Francisco and San Jose, the region has a much smaller innovation and entrepreneurship sector. What shows up clearly in an economic base analysis–which measures industry specialization using location quotients–is that as the Golden State’s capital, Sacramento has a disproportionate number of state government employees. While it’s understandable that one might want to move beyond that established base, it’s good strategic advice to build on your assets. So how could Sacramento do more to turn state government into a key component of its economic strategy? One recurring theme in economic development is that cities ought to tap into so-called “anchor institutions” like universities and hospitals, to promote entrepreneurship and job development. An “Eds and Meds” strategy, can promote economic opportunity, particularly in adjacent neighborhoods, and can be a way of reaching underserved populations. In that vein, maybe it’s time for urban economic developers to add state capitals to the the “Eds and Meds” list of anchor institutions. Like hospitals and universities, state capitals are large, place-based and relatively stable employers with large procurement budgets. On its face, making state government part of an economic strategy seems to contradict one of the fundamental tenets of economic development: that one ought to focus on what we call “traded sectors” of the economy: businesses that compete in national or international markets, and who by doing so successfully generate new income that gets re-spent in the local economy. A key insight behind this principle is that, in general, it’s difficult for the local-serving sectors of the economy to grow any faster than local population and income. The local-serving sectors–things like grocery stores, retail banks, dry-cleaners, plumbers, hairdressers, and the lik–sell all or nearly all of their goods and services to the local population. If you want to grow your economy, you will usually get much more impact from boosting traded sector firms. In general, state and local government gets classified as part of this local-serving sector of the economy. Police, fire, schools, transit and other public services are generally driven, like retail and service businesses, by the size of the local population. For that reason, we generally don’t think about government being a traded sector industry. But economic strategies should recognize an area’s particular strengths, and also address inclusion as well as growth. In particular, if we’re concerned about promoting inclusion creating pathways for local residents to work in occupations that we can be confident will still be in the area two or three decades from now, there are good reasons to focus on state government. If you think about the kinds of criteria that economic developers use to choose target industries, for capital cities, the state government sector seems like one you would choose. In general, economic strategies target industries that have lots of jobs, that have a strong reason to be in a particular region, that are growing, that pay well, and that bring new money into the community. State government jobs do all these things in the Sacramento economy. First, state government is a large employer in Sacramento. According to the latest American Community Survey tabulations, roughly 130,000 state employees live in the Sacramento metropolitan area. Second, the city’s position as state capital constitutes a defensible competitive advantage. Sacramento doesn’t face direct competition from other California cities to be the capital. Regardless of its exact connection to the macro-economy, Sacramento has a strong interest in a healthy, well-managed state government. Working out a resolution to the state’s long term fiscal challenges–such as meeting future pension costs–will affect the local economy, just as much as restructuring in a more traditional basic sector industry. Moreover, thanks to the demographics of state government employment, there are likely to be a fair number of job openings in Sacramento in the next few years. According to the American Community Survey, about 30 percent of state government employees in the region are 55 or older, meaning most will qualify for retirement within a decade. This could produce more than 40,000 job openings in Sacramento, even if total state employment remains flat. Fourth, state jobs pay well. 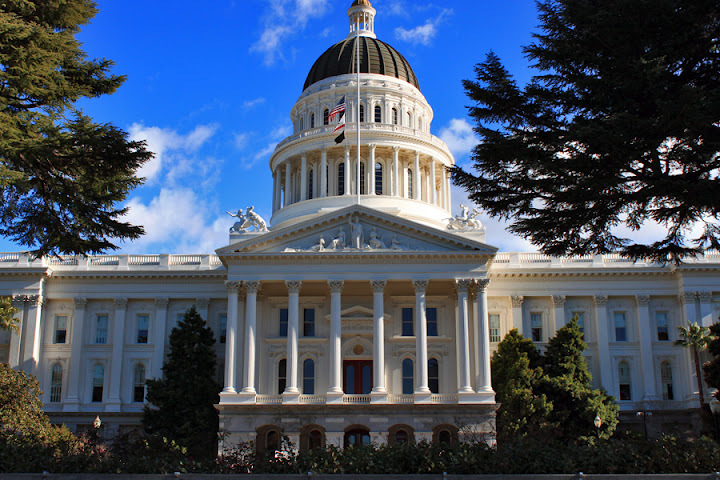 According to data from the Bureau of Labor Statistics, the average weekly wage of state government jobs in Sacramento was about 60 percent higher than the average weekly wage for all private sector jobs in the region. Fifth, even though it doesn’t fit the usual profile of a traded sector industry, as far as the Sacramento metropolitan economy is concerned, state government plays a similar role–it imports money (chiefly tax revenue) from the rest of California, which is then spent in the form of salaries and purchases in metropolitan Sacramento. So, to summarize: state government jobs in Sacramento fit all the criteria one would apply in choosing a targeted industrial sector: it’s a large industry, it pays well, it’s growing, the city has a defensible competitive advantage, and it’s bringing new money into the regional economy. Just as with other anchor institutions, one of the keys may be brokering a stronger relationship between the city government and the institution in question. As Richard Florida has pointed out, the success of an “Eds” strategy hinges on bridging the town/gown divide and transforming what can be an often contentious or transaction relationship into a long-term mutually beneficial partnership. Like most cities, Sacramento has identified the challenge of promoting greater inclusion: How do we help low income populations and communities of color to achieve greater economic opportunity? One of the critical challenges in many traded sector industries is that, in order to compete in global markets, firms need to have highly skilled and educated workers. For example, innovative software and biotechnology thrive or fall based on their ability to hire workers with years of advanced education and experience in these fields, and these firms tend to recruit from national and global talent pools. That makes them poor candidates for hiring lots of entry level workers with modest educational credentials. State government is more like Eds and Meds. While some of the jobs require an advanced education and credentials (teachers, doctors), others offer pathways from entry level jobs to long term employment and in some cases more demanding careers (as in nurse’s assistant, to LPN to RN). As with Eds and Meds, the challenge may be to create entry points and pathways for local Sacramento residents to learn about and prepare for potential state government jobs. Do elementary and high schools have career awareness and job shadowing programs or partnerships that include state agencies? Do these agencies participate in the region’s internship programs for high school and college students? The essence of strategy is recognizing the unique characteristics of your particular situation and capitalizing on distinctive differences. For a state capital city like Sacramento, and particularly in a large and robust state like California, state government jobs are, and will continue to be an important cornerstone of the economy. Figuring out how to leverage this resource to the region’s advantage will be time and energy well spent.